Easily modernize the look of your fireplace with this fireplace screen. Manufactured by Minuteman, this black finish screen will match perfectly with almost any decor theme with its classic elegance and simple design. 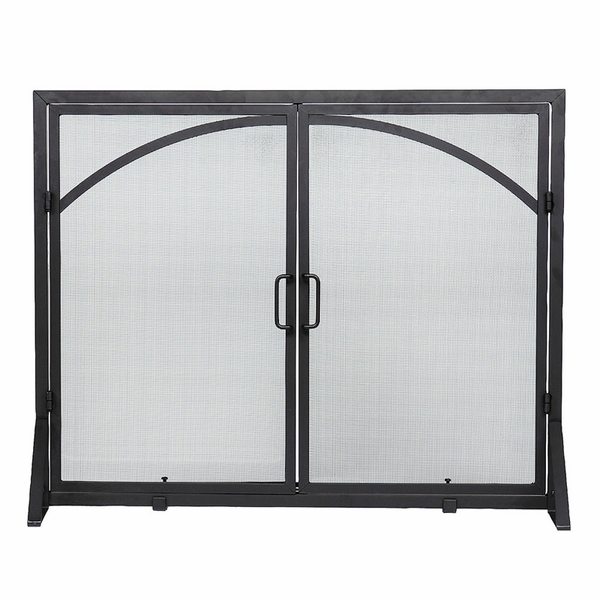 Weighing only 26 lbs, this screen is easy to move around to gain access to the fireplace, yet sturdy enough not to pose a safety hazard. Whether you updating your fireplace, trying to protect your home from sparks or just needing something decorative, this black screen should be your answer! This screen does open in the middle, correct? Both right and left? Does this have feet that go into the inside part of the fireplace? This will have leveling feet positioned towards the center of the screen that account for uneven hearth floors. This screen takes only a short time to assemble, and then it presents an attractive appearance while doing a great job. It has my recommendation. If you do not typically close your flue when your fireplace is not in use, then this is probably not the screen for you. Its design does nothing to prevent air from traveling up the flue. If this feature is not an issue for you, then it is a great screen. It is well built, attractive, and convenient.